Come into our showroom to check out the Overstock and Remnants upholstery fabric sale. 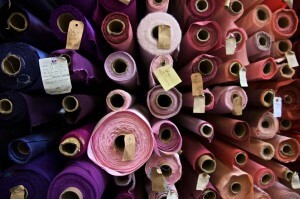 We have over 3000 rolls of upholstery fabric to choose from. It’s perfect for smaller projects and you’ll save big when choosing our in stock fabrics.It’s also a great way to mix and match pieces to get the perfect harmony for your furniture. Only $5-$10 per yard on our in-stock Upholstery Fabric. Originally up to $50 per yard. If you have particular colors or swatches in mind that you would like to match please bring those with you as well. If you have any questions before you come in please do call us. We are an official distributor of all the major upholstery fabric brands that you’ll see in Calico Corners, Robert Allen, and other high end retailers. In fact, many of the high end retailers hire us to do projects for them so we guarantee high quality craftsmanship for every project we do.